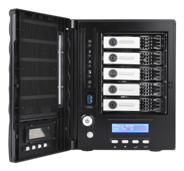 10/30/2012 – The Thecus® N5550 is battling its way up to the victory line within the US media. 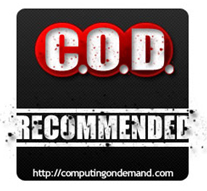 This time US media Computing on Demand better known as “C.O.D.” puts the N5550 to the tests and results are positive. COD considers the Thecus® N5550 the “perfect NAS” as innovative specs and benchmark results elicits the raw power of the 5-bay Thecus® NAS. The storage device sports an Intel® Atom™ processor with 2GB of RAM which tops majority of competitors on the market. In addition, fast file transfers, local display with HDMI output and McAfee Antivirus makes this NAS a one of a kind. 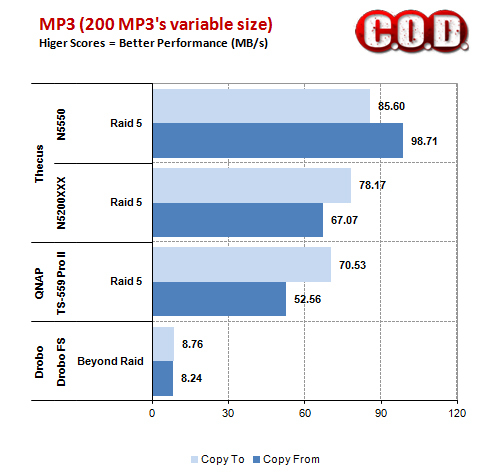 COD uses their own benchmark utility to test the N5550 and compares the results with other NAS on the market. The N5550 shines at files transfers of 200 MP3's, placing it on top of the charts below. Besides power figures, some other interesting facts about the N5550 is the popularity of local display plus HDMI output. 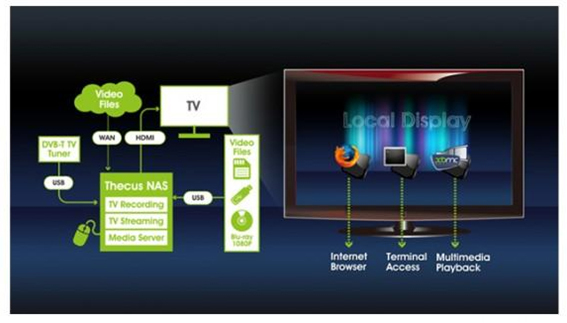 In short, what this means is that users, especially multimedia specific users have the ability to directly connect their Thecus® NAS to the HDTV, display HD movies, music and even display presentations. In fact, with the release of remote control applications for mobile devices such as HippoRemote for Apple and Valence for Android, navigating your multimedia is easier than before. COD points out that the new ThecusOS™ 5.0 is easy to use, even for the novice user. COD simply puts it, “The Thecus Firmware is logical. Things are where you would expect them to be. The firmware is broken down into 9 basic sections which each include various items to administer the NAS.” ThecusOS™ 5.0 has proved itself to be a winner not just by COD but from users around the world. Besides the new UI, features like Data burn and cloud backup is also offered. Data Burn - NAS data can now be burned directly to CD, DVD, and Blu-ray discs with Data Burn, this hassle-free module makes burning data to a disk effortless. In addition, burning ISO image file is also supported. Whether you're managing audio, media or essential files; Data Burn copies information fast while significantly reducing waiting time. The process of burning file to disk is now easy and smooth with Data Burn module. Cloud Backup - The private and public clouds meet with Thecus' new DropBox, Amazon S3 and ElephantDrive cloud backup functionality! Guard your data with RAID at home and an additional level of protection in the Cloud. Just drag and drop files into the folder on your NAS and access them on any computer or mobile device with DropBox, Amazon S3 or ElephantDrive. The quality of the 5-bay NAS by Thecus® is packed with innovative specs, hardware and more importantly, performance. It's rare to see the N5550 perform inadequately and during COD's test and review, the N5550 amazes again. COD explains, “Thecus packs more features and more performance into their NAS than some of the competition that costs nearly twice as much. Aside from the firmware enhancements and the speed, the addition of the Local Display module alone makes this NAS hard to pass up. Construction is rock solid and the N5550 has been serving up files in our office for more than four months reliably.